Be the first to share your favorite memory, photo or story of Elizabeth "Betty" . This memorial page is dedicated for family, friends and future generations to celebrate the life of their loved one. Elizabeth Louise "Betty" Johnston of Harrisonville, Missouri was born February 3, 1935 in Alton, Illinois the daughter of Rudolph Louis and Marie Elizabeth (Murphy) Voges. She departed this life on Friday, February 8, 2019 at Kansas City Hospice House, Kansas City, Missouri surrounded by love and family at the age of 84 years and 5 days. On March 7, 1964 Betty was united in marriage to Robert Eugene Johnston in Kansas City, Missouri. Betty was a homemaker and was also employed as a bookkeeper for Meyer Health Care Services, Kansas City, Missouri until her retirement. She enjoyed doing cross word puzzles and playing cards. Betty had lived in Kansas City before moving to Harrisonville in 1999. Besides her parents, Betty was preceded in death by her husband, Bob on August 5, 2012; her daughter-in-law, Michelle Johnston and a brother, Ed. 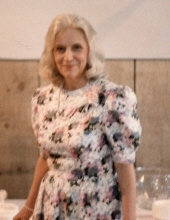 Betty is survived by 2 sons, Robert E. Johnston (Johnna), Cleveland, Missouri, David M. Johnston, Independence, Missouri; 3 daughters, Lisa Roethler, Raytown, Missouri, Julie Andrews (Terry), Holden, Missouri, Karen K. Johnston, Lee's Summit, Missouri; 23 grandchildren, John (Sarah), James, Kayla (Kris), Breanna (Erik), Danielle, Nick, Rachael (Randy), Alan, Abby (Mike), Lynda (Jimmy), Jessica Renae (Chris), Jessica Lynn (Aaron), J.P., Bryce and Jillian; 11 great-grandchildren, Hayden, Hunter, Addison, Dominic, Carter, Chase, Kaley, Jamie, Clara, Juliana and Ava; other relatives and a host of friends. Funeral services will be held Wednesday, February 13, 2019 at 11:00 a.m. at the Dickey Funeral Home, Harrisonville, Missouri. The family will receive friends on Wednesday, February 13, 2019 from 10:00 am - 11:00 am at the funeral home. To plant a tree in memory of Elizabeth "Betty" L. Johnston, please visit our Tribute Store. "Email Address" would like to share the life celebration of Elizabeth "Betty" L. Johnston. Click on the "link" to go to share a favorite memory or leave a condolence message for the family.